Last night the Univeristy of Maryland AstroTerps bundled up and collected images of near-earth astreroid 433 Eros. On its closest approach to Earth in 45 years, AstroTerps caught Eros in the telescopes at the University of Maryland observatory and took images. These images will be submitted to an international database of observations like it that will help astronomers determine the distance to Eros with precision using parallax. The video above shows the asteroid moving on its orbit around sun, as seen through the 6" telescope at the University of Maryland Observatory between 1 and 3:30 AM on February 3, 2012. Eros rotates on its axis once every 5 hours. 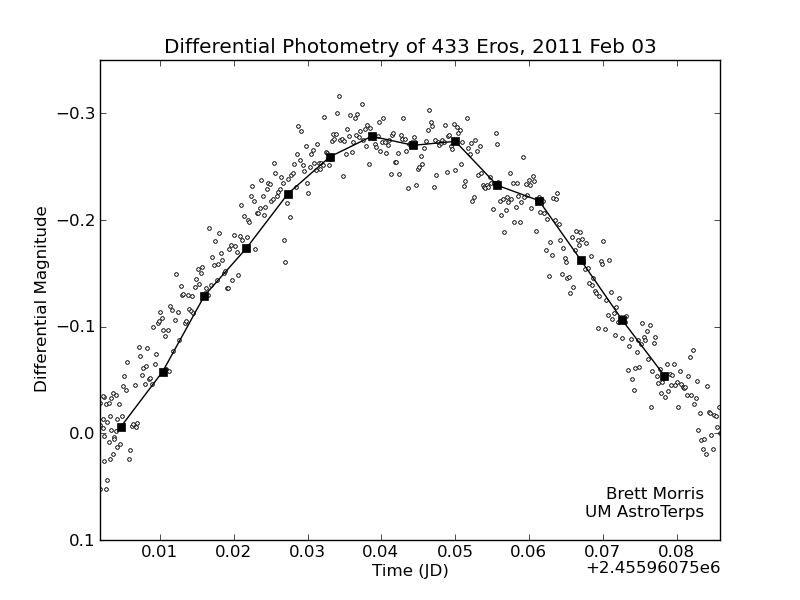 By watching Eros with a telescope and using a computer to monitor its intensity over a 2.5 hour period, we assembled a light curve of the brightness of the asteroid. The rise and fall of the asteroid's apparent brightness has to do with the odd shape of the asteroid shining more and less light at Earth as it rotates. Click the image on the right to enlarge.